When Tyler Wren retired after 13 years as a professional cyclist, he wanted to do something meaningful. He wanted to share some of the best aspects of cycling in way that could have a positive social impact—while still being just plain fun and encouraging people to discover the joy of cycling! Cycling taught Tyler that there is no limit to the work that can be done to become better. Six years ago, he started Wrenegade Sports which held its first Fondo in Rensselaerville, NY and set the standard for giving back to the host community. It’s the many land owners who preserve the peaceful rural landscapes and quiet country roads that we as cyclists all enjoy. The Farm to Fork Fondo series is designed to raise awareness of these working rural landscapes, and support and celebrate the symbiotic relationship between cyclists, farms, and beautiful places. 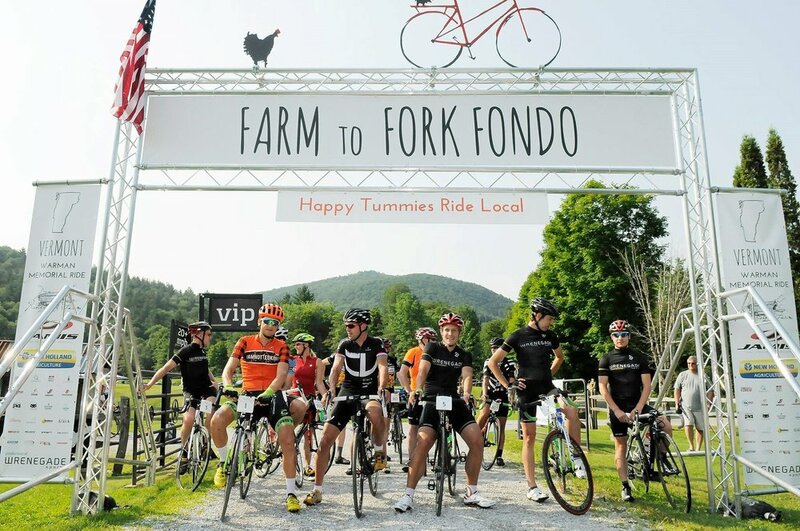 The Farm to Fork Fondo series promotes the farm-to-table social movement. Get ready for a weekend filled with culinary delights made from ingredients sourced from the beautiful farms along the routes. Foodies can celebrate the night before the event at the Meet the Farmers Dinner. Wine and dine with the farmers and chefs, and enjoy a five course farm-fresh gourmet banquet. On event day, work up your appetite over challenging courses through beautiful farmland with timed segments, magnificent views, and farm stop aid stations featuring locally sourced treats. After all the pedalling is done, you can celebrate with the post-ride Farm to Fork Barbecue. Since Farm to Fork Fondo began in 2014, the number of participants has grown steadily—and so has the number of organizations benefitting and the dollars donated. Wrenegade Foundation was established in 2018. The Foundation’s mission is to leave event host communities better than they found them. They have an innovative approach to supporting social-benefit organizations that positively and tangibly impact the event host communities. Wrenegade Foundation prioritizes giving to initiatives that promote farms and help people enjoy healthy, active lifestyles. In 2018 alone Wrenegade Foundation donated more than $50,000 to programs from Maine to Virginia, with 48 causes supported, 960 volunteer hours, 53 participating local farms. Wrenegade Sports contributed $184,901 in direct spending at local farms and businesses and $3+ million in total estimated local economic impact in the rural host communities. Since 2014, more than $100,000 has been donated to support charities and community groups through the Volunteer Competition. Wrenegade Foundation now operates the Volunteers Competition with generous support from participant donations and regional sponsors. If the food doesn’t blow you away, the beautifully crafted routes past orchards, dairy farms and vineyards will! There are four routes for all abilities; from the family and friends Ramble Ride, Piccolo, Medio, right up to the Gran Fondo of approximately 80 miles, which typically features over 5,000 feet of climbing and four timed segments. In true North American Gran Fondo format, cyclists can opt to participate in the Stages Segment Challenge at any of the Farm to Fork Fondo events. The overall male and female winners of the Stages Segment Challenge at each event will win the coveted Polka Chicken Jersey by Pactimo! One lucky participant in the Stages Segment will go home with a brand new Stages power meter worth $800! That’s just one of the many prizes on offer at each Farm to Fork Fondo event. The Pick-A-Prize Raffle features a huge range prizes from a brand spanking new Bianchi bike to a pair of Panaracer tires. Featured sponsors are Bianchi and Ciclismo Classico. 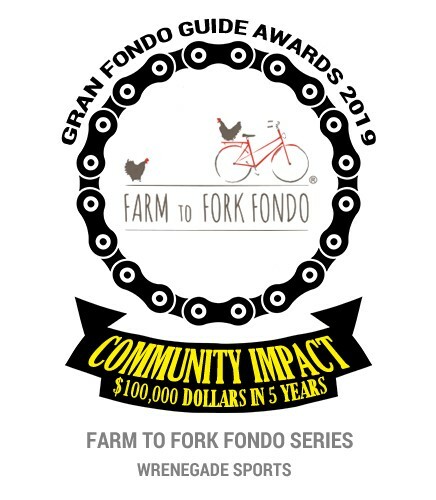 In 2019, Wrenegade Sports launches its fifth annual Farm to Fork Fondo event series. Information for this season's eight events, including ride details, menus, and featured farms can be found at FarmToForkFondo.com. The unique farm-to-table bicycle event series now includes stops throughout the Northeast, Mid-Atlantic, and Southeast. The series has expanded to eight events and is already on course to SELL OUT in advance.